UU’s Bailey Wallen (30) attempts to break a tackle during Saturday’s game with visiting Shepherd. 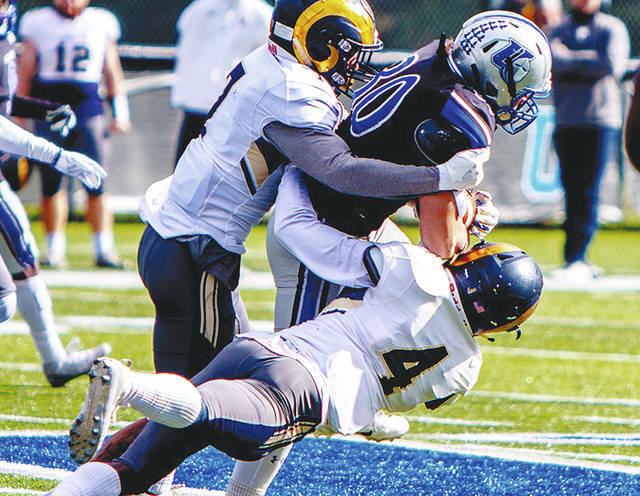 The Urbana University football team (4-4, 3-4 MEC) suffered its third straight defeat following Saturday’s 44-21 loss to Shepherd University (5-2, 5-2 MEC) at UU Stadium. A 74-yard touchdown pass from quarterback Cee Jay Hale to wideout Jesse Bray on the third play of the game gave the Blue Knights an early 7-0 lead. The long air strike, which was Hale’s first career TD pass, was reminiscent of last year’s meeting between the two teams when UU scored on a 75-yard pass play to open the game. However, Shepherd responded Saturday by scoring 37 unanswered points and going 5 for 5 in the red zone. The Rams capitalized on four UU turnovers and outgained the Blue Knights in total offense 422-225. UU limited the nation’s top passing offense to over 160 yards below its season average and had two interceptions, but the Rams found success on the ground with 206 rushing yards. SU took the lead by scoring on its first two possessions with a pair of long drives capped by short touchdown runs by quarterback Tyson Bagent and running back Austin Squire. The Rams added a touchdown right before halftime and after a blocked PAT, the visitors led UU 20-7 at the break. SU opened the second half with a field goal and then the wheels fell off for UU with a fumble on three straight possessions. Those turnovers led to 14 points for the Rams in a span of 77 seconds which included a 21-yard fumble return for a touchdown by defensive end Tatah Ndeh to put SU ahead 37-7. UU finally got some momentum going in the fourth quarter with two rushing touchdowns after the defense forced a pair of three-and-outs. With 8:49 left, running back Isaiah Young broke free up the middle for a 24-yard touchdown run for his longest rush of the season. It was the junior’s third rushing score of the season and fifth of his career. A minute later, freshman Jeff Garcia took a double-reverse handoff 42 yards to the house for his first collegiate touchdown. That made the score 37-21 with 7:30 remaining in regulation. But it was too little, too late for UU. SU’s Squire scampered for a 64-yard touchdown to put the game out of reach with 4:22 to go. He led the Rams’ rushing performance with 132 yards on 23 carries. Young led the Blue Knights with 61 yards on 11 carries (5.5 avg.) while freshman running back Bailey Wallen added 30 yards on the ground and caught a team-high three passes. Hale finished 6-of-13 passing for 98 yards with a touchdown and an interception. Bray recorded his team-leading fifth touchdown reception of the season. Defensively, safety DeArmon Lewis led the way with nine tackles and his first career interception. Chris Richardson added eight tackles while Duray Hall and Onajai Davenport each posted seven stops. Davenport also recorded his 10th career sack. Linebacker Bozton Sanders pulled down his first career interception in the second quarter. For Shepherd, Bagent finished 20-of-30 passing for 216 yards and receiver Ryan Feiss hauled in nine receptions for 60 yards. Running back Ty Hebron chipped in with 72 yards on 14 carries. Linebacker Chrys Lane led the Rams’ defense with eight tackles and 1.5 sacks. SU remains undefeated in the all-time series against UU (6-0). The Blue Knights will travel to Glenville State College (3-5, 3-4 MEC) on Saturday for a noon kickoff in Glenville, W.Va. The Pioneers will be coming off a 52-9 loss at Fairmont State.